*Disclosure: I have partnered with the folks from Teleflora. These opinions are my own and were in no way influenced by another person. I’m a long time Teleflora fan. Over the years, I’ve come to really appreciate their fine attention to deal when it comes to providing beautiful gift options and I’ve found that they partner with the very best floral shops to put together truly amazing arrangements. One of my very favorite things about their seasonal offerings is that they almost always include keepsake containers that are a gift in themselves and can be used for years after the flowers were received. Last week I shared with you our review of Teleflora’s Cardinals in The Snow Ornament bouquet (make sure to enter that Teleflora giveaway here as well!) and this week, I’m reviewing Teleflora’s Hall of Holly Centerpiece and it’s gorgeous! I love candles in the middle of a table, and this bouquet is absolutely lovely. I love the price point as well, because not only are you sending gorgeous flowers, you are sending a gift to be treasured for years! You are also providing the recipient with a wonderful holiday centerpiece that will add to much wonderful beauty, fragrance and color to their holiday gatherings! It’s it gorgeous? It’s so full that I could barely get it all in a photo … and I absolutely love the little holly dish that it comes in, what a wonderful keepsake to use for years to come. 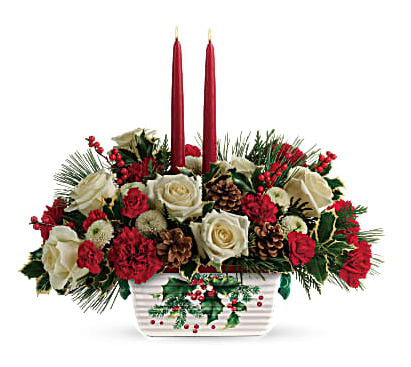 Visit the Teleflora website to checkout their entire Christmas floral bouquet lineup. I love the idea of sending someone a wreath, what a wonderful gesture and something that can be enjoyed throughout the season! ONE lucky She Saved winner will win a code that will allow them to send up to a $75 value bouquet (including delivery fee). The winner can send the bouquet to themselves, or send it to someone they love. This giveaway is good for US residents only. I will leave this giveaway open through December 15th, 2018 at midnight (mnt time) … once closed, I will select one winner who will have 48 hours to contact me to claim their prize! GOOD LUCK!! « Rare Deal! ANIMAL TALES Magazine OVER 1/2 OFF! I really like the Teleflora Festive Pines Bouquet. I like the vintage snowman bouquet. I also like the christmas cactus! I like the Winter Blooms Christmas Bouquet. I really like the Cardinals in the Snow bouquet. I really love the Teleflora's Snowy Daydreams Bouquet, so cute and colorful! Thanks so very much for the chance! I like the Cardinals in the Snow. Christmas Wishes Centerpiece is my favorite - so pretty!! I think my favorite is probably Snowy Daydreams.